What a great night of discussion to kick off the 2015 Living Upp Book Club! If you couldn’t make it, don’t fret! You can join the discussion and share your thoughts in the comments section below. I think it’s safe to say that all of us will aspire to be perfect at something over the course of our lives. Life is competitive that way. We compete with ourselves as much as we compete with others. Likewise, we pursue our personal and professional goals while concurrently working to meet the expectations of our families, friends, employers and communities as well. But at some point, we realize that the pursuit of perfection is futile – and quite exhausting really. We learned from Brene’s writings that being enough is the key to wholehearted living. 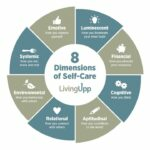 We began our discussion agreeing that even though we’ve all been taught to care for others first, we cannot do it as effectively if we aren’t caring for ourselves. One analogy was the fact that even airline safety protocols instruct us to first put oxygen masks on ourselves before assisting others. Practicing self-love allows us to not only be more physically able to serve others, but it also enables us to be good role models for our children. The concept of resiliency came up several times when discussing the importance of being able to bounce back from negative feedback and experiences. That is most certainly a form of self-love. One attendee shared that she believes challenges come to her to balance her. Embracing those difficult experiences has helped her accept that life isn’t perfect. Another member described her approach to resiliency as a mind-set of being “excited to see what happens next” rather than being tied to outcomes. In addition, forgiving ourselves when we fall short of expectations – whether internal or external – is also an example of practicing self-love. We discussed the notion that we all have inner and outer selves, which we express differently depending on the circumstances. Admittedly this can be difficult, especially if our inner selves don’t match the situation. For example, if you felt like wearing pajamas to dinner (expressing your inner self), you may not be able to dine in certain restaurants. Similarly, we discussed how others perceive us versus how we would like others to perceive us. Having the courage to live authentically is easier said than done, but giving ourselves permission to be who we are is a great first step toward living wholeheartedly. We spent a lot of time talking about this one. In many ways, societal norms have established a multitude of shoulds for us. I once heard someone refer to this as “shoulding on yourself.” I mean, that’s what it feels like, right? One example Brené presented in her book was the expectation that good parents should pick up their children on time without exception. The reality is that we all mess up sometimes. External standards bleed into other areas of life as well, including how clean our homes should be. We talked about the difference between meeting the accepted standards of “clean” and being okay with saying, “My house is as clean as I want it to be.” It’s ironic that we often compare ourselves to the Jones’ even though we know they are as flawed as we are. Since perfection doesn’t exist, the Jones’ are simply living a façade of perfection. And that means we are pursuing a façade as well. Religion can be a source of high expectations too. The Christian faith, for instance, holds Christ to be the standard of perfection, so emulating Christ-like qualities often leads to the pursuit of near-perfection. If you consider Maslow’s Hierarchy of Needs model, it might seem that our pursuit of perfection could be related to our innate need to feel safe. Maybe we believe, wrongly or not, that if we do all the right things perfectly, then we will avoid experiencing pain and suffering. (If only that were true.) We agreed that even if perfection was attainable, it wouldn’t guarantee that we would escape life’s disappointments. Finally, we explored how external pressures differ among cultures. In Blue Zone* areas, where life expectancies are longest, there seem to be fewer societal expectations around perfection. Interesting to say the least. The concept of being enough was definitely a central theme of the night. How does one define enough anyway? And how exactly do you achieve enough? Those of us who are goal-driven have a tendency to want to measure or quantify many aspects of our lives. For example, if we view our progress as being at only 80% of our full potential, are we merely self-imposing unnecessary pressures? Is 80% sufficient? Is it enough? One member explained that she reaches her enough when she feels tired. That is her measure of satisfaction that she has done enough. Furthermore, who exactly defines our potential? That question prompted a great deal of discussion. We finally decided that potential is ultimately an inside job. We can cheer and encourage those we love to use their gifts and achieve milestones, but we cannot define their enough. All of us must decide for ourselves how we want to live – and what is enough for us. We did acknowledge that sometimes it’s frustrating or disappointing to see others not realizing what we see as their full potential. Should parents pass along their wisdom in the form of external pressure – or allow their children to have their own journey? We left that topic deciding that potential is synonymous with growth, not necessarily an end point that can be defined. And what happens when we do manage to successfully reach those near-perfect milestones or goals? More often than not, the bar gets raised higher. Perfection gets pushed just beyond our reach again, and we continue to pursue false peaks. Essentially, each summit reveals another in the distance and the pursuit never ends. Finding satisfaction in our definition of enough puts and end to that game. In her book, Brené described her discovery of the importance of play. That intentional process of letting go and tapping into the creative side of our brain is therapeutic and necessary to live wholeheartedly. Brené does a great job convincing us that it’s perfectly okay, healthy even, to embrace our imperfections. Being “okay” with ourselves and how we choose to do things is liberating. I learned so much from the others in the group, and I’m already looking forward to next month’s meetup! What were your impressions of the book? Please share your thoughts below or on the Living Upp Facebook page…we’d love to learn from your perspective as well. *Living Upp is a participant in the Amazon Associates Program, which means we earn a commission from qualifying purchases. It’s Time To Do Life Differently! This entry was posted in Book Club and tagged cognitive, emotive, good books, imperfection.